WASHINGTON — Border Patrol agents could arrest as many as 90,000 children trying to illegally cross the Mexican border alone this year, more than three times the number of children apprehended in 2013, according to a draft internal Homeland Security memorandum reviewed by The Associated Press. In the May 30 memo from Border Patrol Deputy Chief Ronald Vitiello to the National Security Council’s transborder security directorate, Vitiello said Homeland Security’s Office of Immigration Statistics estimates that by 2015 the number of children apprehended while traveling alone could grow to 142,000. The government has previously estimated that more than 60,000 children could be apprehended along the border this year. All the estimates are for the government’s fiscal year, which begins Oct. 1. Children apprehended with their parents are not part of this count of illegal border crossings. Most of the children caught crossing alone are from El Salvador, Honduras and Guatemala and have been apprehended in the Border Patrol’s Rio Grande Valley Sector in South Texas. 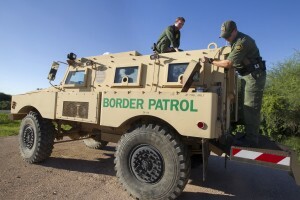 That sector is the now the Border Patrol’s busiest area along the Mexican border and has seen a significant increase in the number of border crossers from Central America. Releasing those people and taking other actions such as reuniting children caught alone at the border with parents or other relatives already in the U.S. serve as “incentives to additional individuals to follow the same path,” Vitiello wrote. The number of children found trying to cross the Mexican border without parents has spiked in recent years. Between 2008 and 2011, 6,000 to 7,500 children per year ended up in the custody of the Health and Human Services Department’s Office of Refugee Resettlement. In 2012 border agents apprehended 13,625 unaccompanied children and that number surged to more than 24,000 last year. Vitiello’s memo was drafted just days before President Barack Obama declared the situation on the border an “urgent humanitarian situation” and appointed the head of the Federal Emergency Management Agency, Craig Fugate, to manage the government’s response. In a presidential memo issued Monday, Obama said the government would temporarily house some of the children at two military bases. Last month the Office of Management and Budget said in a two-page letter to the chairwoman of the Senate Appropriations Committee that the increase in the number of children crossing alone would likely cost the government at least $2.28 billion, about $1.4 billion more than the administration had initially asked lawmakers to budget for its “Unaccompanied Alien Children” program. The average stay for a child in a U.S. shelter last year was 45 days. Most are reunited with family to wait for their immigration cases to move forward. Migrant kids remain in removal proceedings even after they’re reunited with their parents here, though many have been able to win permission from a judge to stay in the U.S.